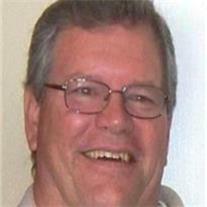 Send Photo of Joseph Herman Rauch Jr.
Rauch, Joseph H. Jr., 59, of Mesa, AZ, died June 15, 2012. Born April 11, 1953 in Newark, Ohio, Joe attended Coronado High School and served in the US Navy during the Vietnam War. He was a dedicated employee of SRP for 36 years. Joe loved and adored his wife, Dollie, taking immense joy in their children. He considered his greatest accomplishment to be raising happy, successful and confident children and grandchildren. Joe was preceded in death by his father, Joe, and brother, Bill. He is survived by his high school sweetheart, Dollie; 3 children, Bob (Janet) Rauch, Becki (Scott) Chapman, Bryan (Tonia) Rauch; 9 grandchildren, Brittany, Kelli, Brooke, Aubri, Dylan, Kaylee, Lily, Leah, & Brody; his mother, Betty Rauch; 3 brothers, Jim, Nick, & Dave, and many other beloved relatives. Visitation Wednesday, June 20, 6 – 8 PM at Bunker’s Garden Chapel, 33 N. Centennial Way, Mesa, AZ, 85201; 480.964.8686. Services Thursday, June 21, 10 AM at Queen of Peace Catholic Church, 141 N. McDonald, Mesa. Burial to follow at City of Mesa Cemetery. Contributions in lieu of flowers may be made to the 100 Club of Arizona through Arizona Federal Credit Union by calling 602.683.1000.